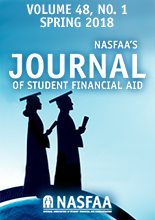 The Journal of Student Financial Aid is a peer-reviewed outlet featuring works of significance in all areas of postsecondary student financial assistance. We invite the submission of manuscripts that report original research findings; editorial opinions on policy issues; and book reviews. Starting in June 2013, Journal articles, issues, and submissions are presented in the Journal of Student Financial Aid repository and micro-site. Powered by BePress Digital Commons publishing and editorial management software this suite of tools and services enables publishers to manage and display scholarship on the web in a highly visible online showcase. Content is full-text indexed in major search engines like Google, Bing, and Google Scholar. In addition, an extensive search tool indexes JSFA papers and objects by topic, author, keyword, or institution. Customized email alerts and RSS feeds are also available to readers, allowing them to be automatically notified of new research. The site also includes the Editorial Board listing, author guidelines and submission procedures, and a brief history. The Journal of Student Financial Aid (ISSN-0884-9153) is indexed and abstracted in the Education Resources Information Center (ERIC), 1972 - present.